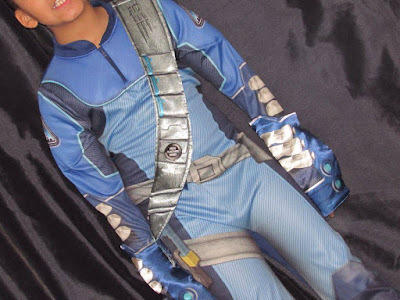 Recently, me and Spud was invited to review a brand new Scott Tracy costume, who most of us know from the classic TV show Thunderbirds Are Go! I remember watching the show a countless number of times when I was a child, and smiled whilst reminiscing when Spud started to watch the show recently himself. Pretend to Bee are a children's online costume/dressing up specialist, they're a family run business and have been retailing since 2005, all their dressing up costumes are hand picked by their dedicated team and include the following ranges, traditional doctors and nurses for pretend play, educational tabards for learning through play, themed princess and pirates and a partywear range, suitable for special occasions. The company have been featured on the popular ITV shows - This Morning, and Pride of Britain Awards. Priding themselves on the reputation the company have built up, both myself and Spud was very impressed from the get go, down from their impressive website, to the costume selection they have, and to how the costume arrived! The Scott Tracy costume is a fully printed, 100% polyester, all in one suit, that's loaded with lots of added extras, making it a costume like no other! 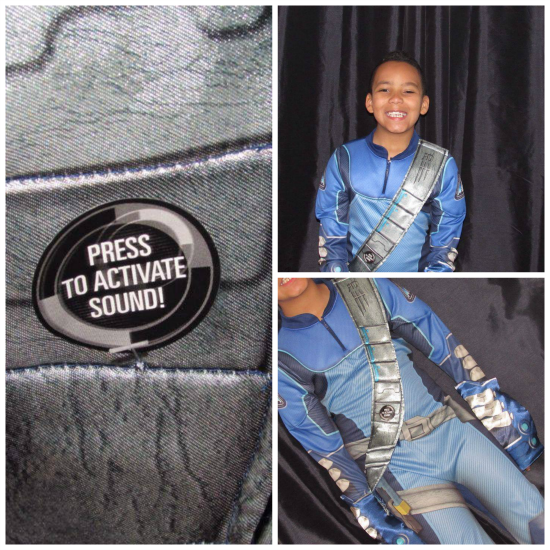 It has a printed satin sash which features a sound chip that says five, four, three, two, one, blast off! 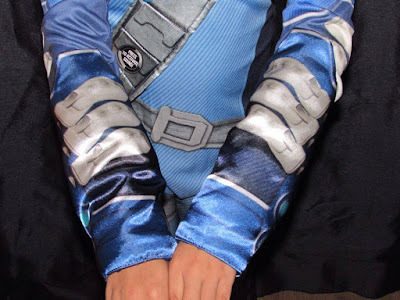 The costume also comes with a pair of gauntlet forearm accessories, just like Scott's in the TV show! We got the costume in 9-10 years, Spud is nine but is very tall for his age, so prior to the costume arriving, I was a little worried it wouldn't fit him in the leg, however, I had nothing to worry about because the costume fitted really well, and it wasn't tight around his tummy, arms, or any other areas. 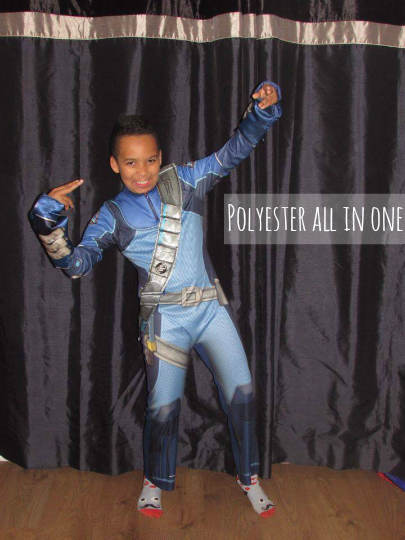 The front of the costume has a small zip that comes down by a few inches, helping your child get the costume on comfortably whilst stepping into it as it's an all in one. The back of the costume is fastened by velcro, again making the costume that extra bit comfortable, and giving it that extra bit of wear whilst wearing. The printed satin sash that features across the front of the costume has to be Spud's favourite part of the costume, and I can't disagree with him, any costume that makes noise is fab, but when you press the chip, and you hear those famous words; five, four, three, two, one, blast off, you can't help but have a great impression of the costume! The costume also comes with two removable forearm accessories, just like the real Scott Tracy from the show! 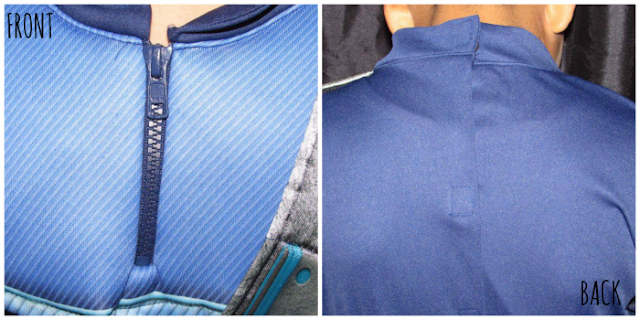 They simply slide on and off the arms, making it extremely easy for children to do themselves! It's then just as simple to move them into position! 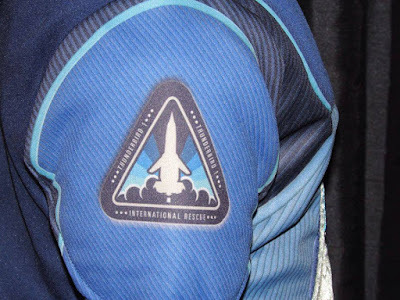 Last but not least, we can't forget the logo on the side of the costume can we? Spud told me it's his badge to get into the secret Thunderbird's club, where all the latest missions are planned and spoken about! Overall, both myself and Spud love this costume and can't find a fault with it! The only thing we would change is the size range it goes upto! Spud seems to be growing continuously, and sadly won't see much of this costume as he is sure to soon outgrow it! However, he's had great fun wearing it so far, if he could he'd wear it every single day, and has already made plans to wear it for the next dress up day at school! Everytime he presses the sound chip, a burst of laughter leaves his mouth, it's fun all round! The Scott Tracy costume can be purchased from Pretend to Bee for £24.95 and comes in four different sizes. To find out more about Pretend to Bee, and to view their other great costumes, check out their official website here, find them on Facebook here, or follow them on Twitter here. 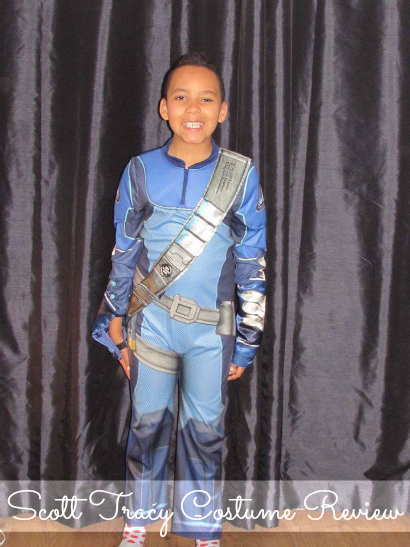 I really do like the look of this, Monkey is getting some Thunderbird DVD's for Christmas so I can educate him, this costume might have to be a present for the future.